CP/CENT/INT/1. Seven files containing handwritten notes, etc., by John Gollan on Mao's On the correct handling of contradictions among the people, at the 1957 conference of sixty-four Communist parties, and on the Sino-Soviet dispute in 1960. Also notes by Gollan, George Matthews and James Klugman on the 1960 International Communist Conference. 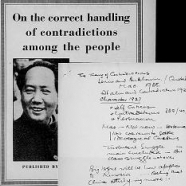 Materials relating to Mao's "On the correct handling of contradictions..."
CP/CENT/INT/01/01. Notes taken by John Gollan and materials assembled on Mao's On the correct handling of contradictions among the people. CP/CENT/INT/01/02. Notes taken by John Gollan at the 1957 conference of 64 Communist parties. Includes handwritten notes of his interviews with Mao Zedong, notes on the speeches of Khrushchev, Togliatti and others. Text of Gollan's speech and notes thereon, general report on the conference, and notes (by Bill Wainwright?) of Gollan's report back to the CPGB PC on the conference and his discussions with Mao. Created November 1957. CP/CENT/INT/01/03. Notes for a speech by John Gollan and materials assembled on the issues in the Sino-Soviet dispute in 1960. Includes Soviet news and Hsinhua press reports, note from Emile Burns to Gollan on article in Kommunist, etc. Created 1960. CP/CENT/INT/01/04. 1960 International Communist Conference. Created 1960. Seven notebooks and several loose sheaves of paper. George Matthews' handwritten notes on the sessions of the drafting commission, which sat for 20 days before the opening of the conference. CP/CENT/INT/01/05. 1960 International Communist Conference: Ms. notes taken by John Gollan and George Matthews at the sessions of the conference. Created 10-24 November 1960. CP/CENT/INT/01/06. 1960 International Communist Conference: Notes taken by John Gollan, along with other papers of the conference, some published material and reports, duplicated versions of Gollan's speech, etc. Created 10-24 November 1960. CP/CENT/INT/01/07. 1960 International Communist Conference. Notes by John Gollan and other materials for reporting the conference to the CPGB leadership. Includes the text of Gollan's report to the CPGB EC, James Klugmann's notes on the meeting and discussion. Created 1960.